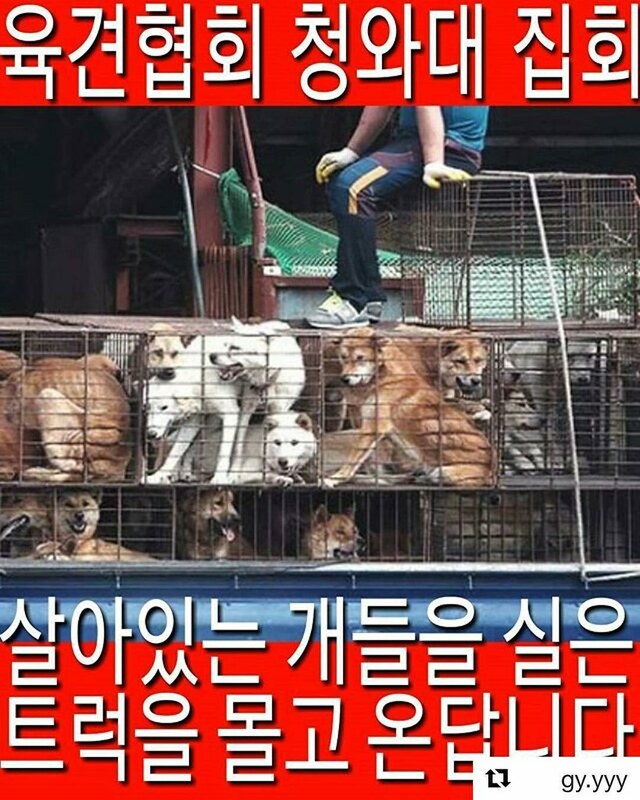 Home / Blog / Urgent Call to Action – Stop the Korean Dog Slaughters’ Demonstration in Seoul! [Update] Click HERE to see the update on this demonstration. Click HERE to see Susan’s post on Facebook. Protest is planned by the Korean Dog Meat Association at the Korean Presidential residence (Blue House) in Seoul on September 22, 2017. They plan to bring live dogs in trucks to the protest in defiance of defending the dog meat trade/industry in South Korea. Please take the action to file petition asking Korean government to not allow this protest to take place. ?️Call to action: #URGENT!!! SHARE & TAG OTHERS!!! ?️Deadline #ASAP!!! 1: read my letter at the end of this post to understand the issue. 3: copy and paste my letter at the end in the complaint form. 4: attach these 3 photos from this post with your form. 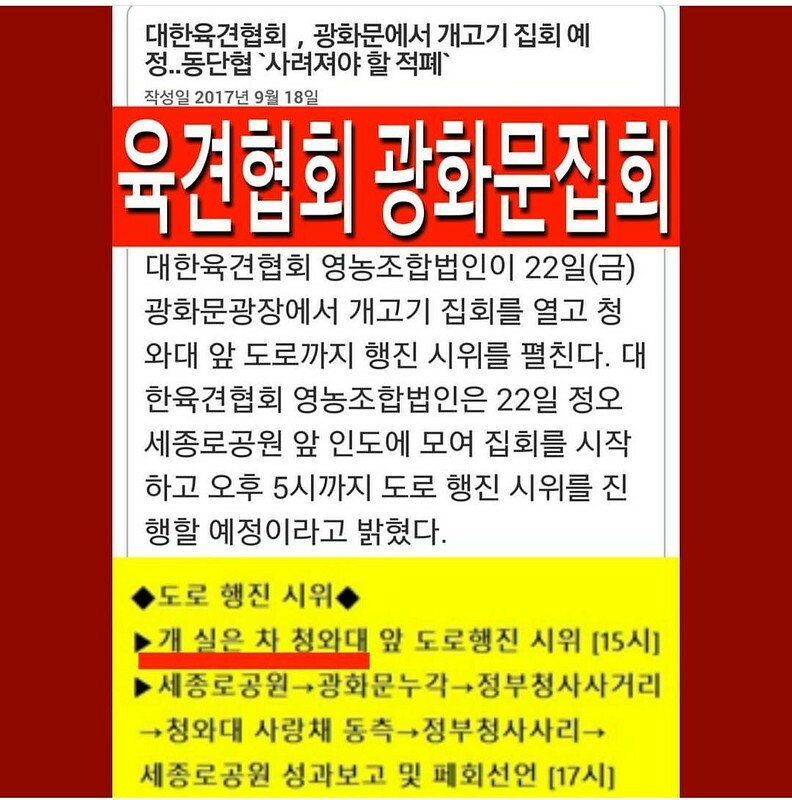 I have created a tutorial #Video on how to submit a complaint form to the Government of S. Korea, www.epeople.go.kr. This can only be done on a #pc, NOT a mobile device. 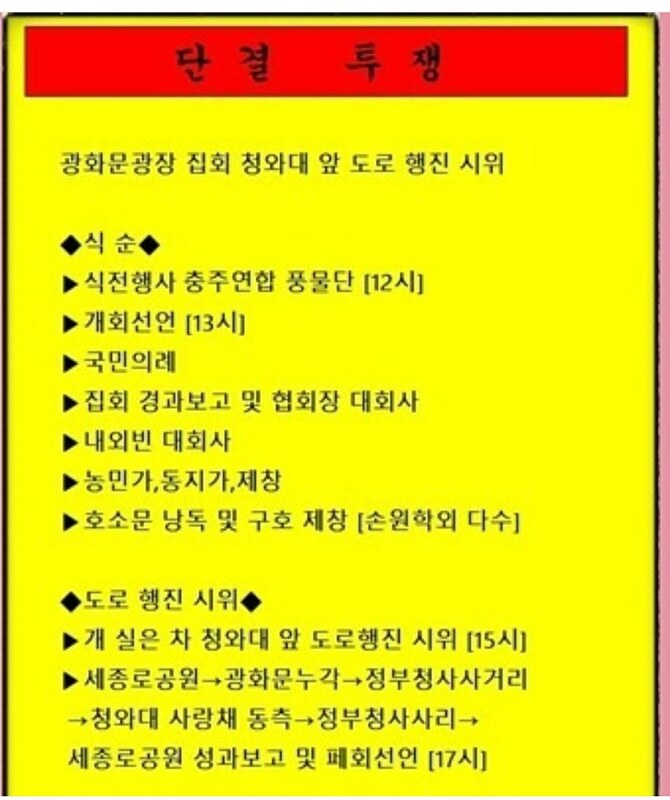 This is for both the citizens of Korea and foreigners, and they will respond to you. English is accepted. ?LETTER TO COPY & PASTE. ??? I formally submit this complaint regarding the planned protest by 개고기 육견협회, the Dog Meat Association, at the Presidential Residence(Blue House, 대한민국 청와대) on September 22, 2017. They plan to bring live dogs in trucks to the protest in defiance of defending the dog meat trade in S. Korea. I respectfully ask you to not allow this protest to happen. The dog meat trade is an illegal activity that is nothing but a shameful mark on the Korean nation that which has been drawing huge negative attention internationally for decades. There is an ongoing boycott of not only the upcoming PyeongChang Winter Olympics but of all things, such as travel and Korean products! We, the international animal lovers, keep a very close eye and monitor the progress on the status of banning of dog and cat meat trade in your country. We urge you, the Korean Government, to please take your stand and to not allow this day on 22nd be the day of great shameful display by 개고기 육견협회 시위 (dog meat association demonstration). Thank you and I await your favorable reply. I believe that when you hear the words “bad behaviour against animals”, you only think at dogs, cats, guinea pigs or parrots only. YOU are not better than Korean, those who don”t want to see the bloody animals reality in their country are sadly not better than Korean. Bye, wish i will never meet you. Wrong. Firstly you must consider that most vegans start animal compassion with dogs/cats, making the connection and spreading the compassion to other animals. What kind of compassion do you think a dog eating country will ever have for a cow, a pig, a chicken (which they ALSO eat) ? The idea must ALWAYS be: fight for dogs/cats and remember other animals, go vegan. It must NEVER be: “If one animal is killed somewhere in the World, it’s ok for South Korea to kill all of them”. Wrong! They believe that adrenaline is the animal before death creates tastier meat. So, they have come up with horrendously cruel ways to torment and torture the dogs and cats before and during the slaughter. I won’t even begin to describe the sickening ways they have thought up to torture these animals, but it’s beyond anything a mentally sane person could dream of. I can only speak for the US, that yes, it’s cruel to kill living creatures of any kind for meat, and far too many live very sad lives, but they are usually slaughtered in a more humane manner, and not tortured to make the meat better. Karma will get you soon! Justice will be done! Please do not let dogs be used in this protest – they are sentient beings and we humans should respect that and act responsibly. This is insane, stop it immediately. I AM SO SICK OF HUMANS! HOW THE HELL IS THIS STILL HAPPENING?!?!?! STOP! NOW! FOREVER! Glad we went to war for you barbarians. Stop this protest. This barbaric act has to stop!. Dog’s have feelings too. What kind of people are you! The most evil in the world. Maybe a present from N.Korea will end your reign of cruelty, just sad about the loss of all our four legged friends..
S. Korea is just as horrible as N Korea…They’re all a bunch of scum bag, sub humans. Dog & cat slaughter/consumption NEEDS TO END NOW!! You can always judge a nation by the way it treats their animals. Humanity has MUCH to learn and progress on!!!! You sick greedy evil no conscience filthy sub humans. Dogs are better than you. They feel love and they just want to be loved. North Korea will hopefully end you. I worry about the dogs…evil, evil, you will pay for this in hell. Ako môžete zabíjať mačky a psíkov, sú to predssa inteligentné a spoločenské tvory a žraž ich ste hamba civilizácie !!! Týmto okamžite žiadam prísny ZÁKAZ ich zabíjania…!!!! This is so disgusting! I will NEVER visit your country until this is ALL stopped and ended! STOP KILLING DOGS AND CATS !!! to distroy your Country soon and then we are so happy ?????☠. This just wrong. Please don’t alow this or you are just as sick as North Korea. This vile, despicable atrocity truly show who you are. Soulless, without morality or compassion. You truly are as evil as your northern neighbour. To torture and slaughter innocent defenceless dogs and cats and bears is beyond any horror normal humans can fathom. I continue and urge others to boycott all products, events and The Olympics 2018. Truly hell on earth. YES! Well said! Hit them in the pocketbook, that’s the only thing they care about. Boycott all Korean made products! This is disgusting and inhumane. Get rid of these soulless sub humans please. If you allow this to happen, may you receive all the Karma you deserve, if not in this life then the next life. Your state is no better than North Korea. Shame on you! I pray that GOD throws his WRATH upon ALL HE who HAS PARTICIPATED!!! Although I fiercely object to the dog and cat eating practices in S. Korea, I am horrified by the many posted comments vilifying Koreans. First, not all Koreans participate in these activities. Second, before we condemn Koreans, North or South, as “sub human” or “scum’ or any of the other epithets people are hurling at them, we should remember that our very own meat industry enacts comparable torture on animals who are sentient beings like dogs & cats (for example, pigs, cattle, sheep, etc.). People who live in glass houses shouldn’t throw stones. We need to protest the Korean dog meat industry but we need to protest the N. American and European meat industries with equal passion. And we should never condemn entire nations. That’s no different from Trump’s Muslim ban. SOOO I eat berries and corn and beans and lemons and peppers and garlic and pink salt…plenty of whey…when I pray, chant, sing in the woods the deer come round my cabin and walk with me and nuzzle my hand as we amble along…all the creatures love to sing and dance to music too! They sing right on key and they move right on que! Doggies and kitty cats sure do too. The froggies and foxes I know for sure do… I love animals wild and domestic beyond forever it’s true. Thank you! Thank you! Thank you! This evil must end NOW. I will never visit this country & will boycott anything to do with it, you have no heart. Dogs are family members who deserve to be loved and cared for. You people from S Korea who torture and kill innocent animal should go to hell and burn.That’s what you deserve. What is the purpose of this protest? Is it to say that you should be able to torture and eat dogs and cats? Why are the Asian communities killing off the world’s wildlife and do so cruelly? Do you have no feelings of empathy towards another feeling being? You cause pain and distress. It is sickening. I will never visit your country or buy any of your products as long as you act this way. Your behaviour is atrocious and despicable. I find it hard to class you in the human league. Please stop it immediately. This is the most barbaric, evil, cruelty ever. What is the matter with you sub humans, you obviously have no heart or soul. Dogs are domesticated, loving and loyal, unlike you evil monsters. I will never visit your country, or buy your products, or any country that participates in this horrendous cruelty. Shame on you. Dogs and Cats are not for human consumption and this barbaric cruelty needs to stop now. They are mans best friend and are family members. They will stand by you when no one else will. Stop this torture and cruelty to our animals. c’est honteux, cruel …. l’être humain n’a vraiment pas de cœur !! Aidons ces pauvres bêtes à sortir de cet enfer. I boycot all s. korean products ! so sad, what your people are able to do to the poor dogs. Disgusting nation, shame on you ! This must not be allowed,these sick,evil individuals must be stopped. Please may the authorities of Korea realise the eyes of the world are on them. This isn’t a protest, it’s murder, and if these people do this the Korean populace should drag them off the streets, and hang them. Forget cultural relativism. It is barbaric to torture, murder and eat dogs and cats, animals that have been domesticated and have served man for thousands of years. They serve us, we shouldn’t serve them. You are raising the ire of the world by your filthy practices. All countries the dogs eat has quite forfeited to be saved by dogs! Shame on you! Dogs are best friends, familymembers and rescuer! Please stop this cruelty. You are all barbarians? So, Korea, this is the way you wish to go down in history??? Dog eaters??? Barbaric PsOS! Hit these evil bastards in the pocket by boycotting the winter Olympics,as they don’t care about anything else, obviously animal welfare is the least of their concerns. They are sub human filth. Stop and put those Devils into Jail !! !